Three new Samonji cards appear with various abilities. AUTO (VC): [Counter Blast 1 & Choose 1 face-down “Kousetsu Samonji -Hanamaru-” in your G Zone, flip it face-up] When this card attacks a Vanguard, you can pay the cost. If you pay it, choose up to 1 of your Rear-guards, return all other Rear-guards of all Fighter’s Rear-guards to the hands, and if 3 or more were returned, this Unit gains Power+10000. AUTO: [Counter Blast 1 & Soul Blast 1] When this card is placed on (VC), you can pay the cost. If you pay it, search your Deck for up to 1 Grade 3 card other than “Souza Samonji -Hanamaru-“, Ride it at Stand, then choose up to 1 “Souza Samonji -Hanamaru-” from your Soul, Call it to (RC), then shuffle your Deck. AUTO (RC): [Soul Blast 1] When this card is attacked, you can pay the cost. If you pay it, return this card to the hand. AUTO (RC): [Counter Blast 1] When this card attacks, if there’s a face-up “Hanamaru” card in your G Zone, and you have more cards in your Damage Zone than your opponent’s, you can pay the cost. If you pay it, during that battle, this Unit gains Power+5000 and Critical+1. “Kousetsu Samonji -Hanamaru-” is a G Unit with a skill that returns Units to the hand. When it attacks, you can flip a face-down “Kousetsu Samonji -Hanamaru-” in the G Zone face-up and pay 1 Counter Blast, you can choose 1 ally Rear-guard, and then all other Rear-guards on the board are returned to the hand, and if three or more return to the hand, this card gains Power+10000! Since it increases your hand, you can gather the cards you need to guard against an attack during your opponent’s next turn, and in addition to obstructing the Stride Skill of cards like your opponent’s “Dragheart, Luard”, it also returns meddlesome Units like “Nurse of Broken Heart” back to the hand, meaning this is a card that can be used offensively and defensively. 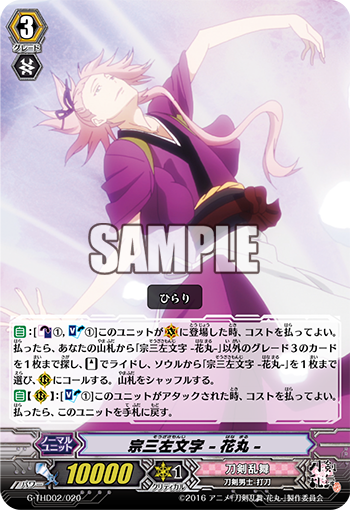 Following up, “Souza Samonji -Hanamaru-” has an ability to exchange Vanguards, as when it’s placed on the Vanguard Circle, you can pay the Cost to Ride 1 Grade 3 card from your Deck except “Souza Samonji -Hanamaru-“, and then Call this card from the Soul. By using this ability, it’s Good to Ride a Grade 3 with a Stride Skill. And when it attacks, you can pay 1 Soul Blast to have it returns to the hand. By returning it to the hand, you’ll be able to secure the cost of Stride during your next turn. “Sayo Samonji -Hanamaru-” is a Rear-guard with an ability to increase its own Critical. When it attacks, if there’s a face-up “Hanamaru” card in the G Zone, and you have more cards in your Damage Zone than your opponent, this card gains Power+5000 and Critical+1. It works quite well with Stand Triggers, as if it Stands, it can repeatedly activate its Skill, applying quite suitable pressure on the opponent. We’ll be introducing more cards from “Touken Ranbu -Hanamaru- Deck Sets 1 & 2” in future “Today’s Cards”! Please look forward to them!